From career stylist Alexandra Suzanne Greenawalt, Love What You Wear: Mastering Your Style in Multiple Homes is a wonderful tool that will help women cut through the stress when it comes to selecting what is best to wear for every occasion, avoiding losing time in the process, and boosting their confidence through the wonderful art of selecting just the right clothes they need and feeling awesome in them. It’s a clear fact that what we wear becomes part of our expression and the medium through which our attitudes and personality come across to others, and that is why women spend a lot of time looking for the kind of clothes that will allow them to make a strong statement about themselves. 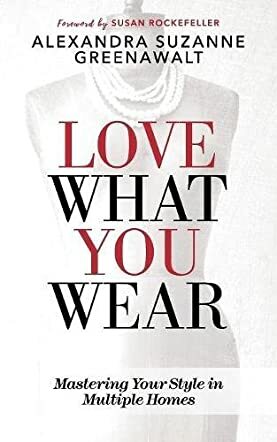 In this book, the author offers powerful tips and insights that will help any woman be their best dressed self. One immediately gets the impression that one is reading work from a professional in the field and that the subject is well-researched and wonderfully articulated. Alexandra Suzanne Greenawalt writes with the confidence of one who has spent years studying and helping others in the subject, and her writing is compelling with an authoritative voice that comes across clearly. The prose is excellent and accessible, making the message of this book easy to grasp by a wide audience. Love What You Wear: Mastering Your Style in Multiple Homes offers readers the easiest approach to dressing smart and feeling comfortable in what they wear. This is one of the books I needed to have read growing up and one that I find very helpful for every woman. You’ll dress differently, feel differently, and approach your day with fresh energy after reading this book.